January always feels like such an incredibly long month. And this year's has been no exception. We seem to have been busy but I can't really pinpoint what it is we've achieved, there has been a lot of working, chores, errands and such like; we've been getting back into routines after Christmas I guess. But while we haven't done anything especially glamorous or exciting, we have had lots of family time and therefore it's hard to complain... although some nice weather some time soon would be good! 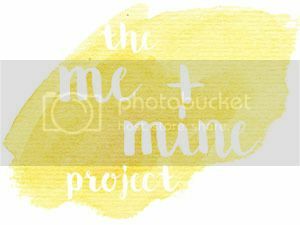 I'm so excited to be starting another year of The Me and Mine Project. To say that taking these photos each month is something I'm passionate about would be an understatement. Some months it's easy, some months are more of a challenge... but I never regret for a second that we make that effort to record our family as it grows, and to capture a moment each month of us together. It feels like my little family has come a long way since I started this project three years ago. That January we had snow... oh how I dream of a little bit of snow. Our biggest girl was around the same age that our littlest girl is now. It's sort of mad to think how much the children have grown and changed in that time, not least our littlest one who we couldn't have even dreamed of way back then. My brother took those photographs for us back in 2013, and I think it's a nice bit of symmetry that he also took this month's photos for us too. There are so many subtle things about these photos that I love. My biggest girl and her daddy are having quite "a thing" this month, and it wasn't until I started editing them that I realised that she is in constant contact with him in these photos. I also love her muddy knees... that's her all over. Out of the car for two minutes and already covered in mud. I love that is every single photo you can see a little bit of the bond between my three little loves, they are seemingly always touching or kissing or smiling for one another. 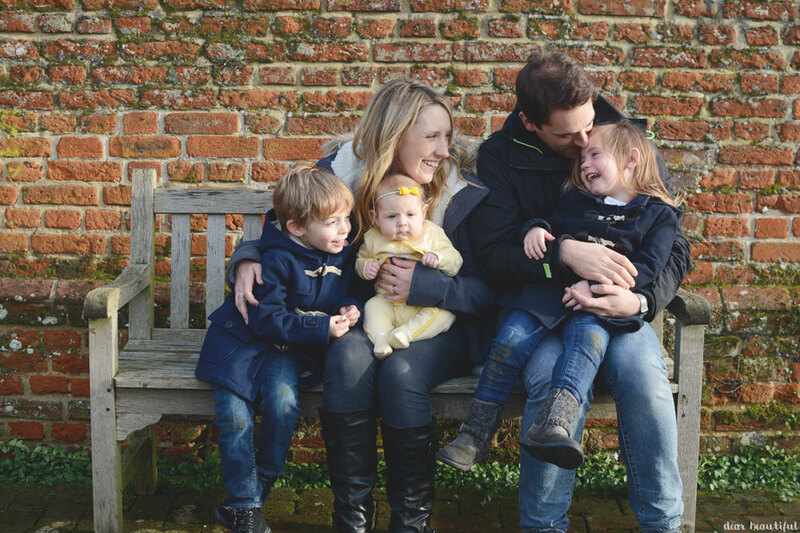 And I also love how our littlest totally steals the show with her totally bemused expressions, as if she's thinking "what on earth are these crazy loons making me do now?"... she's got a lot to learn! So that's our January snaps... And that start of another year. The Me and Mine Project 2016 officially starts here and I couldn't be more excited. This year The Me and Mine Project is also on Instagram, so do pop over to @meandmineproject and give us a follow. Add #meandmineproject to your photos and then we'll be sharing some of our favourites. 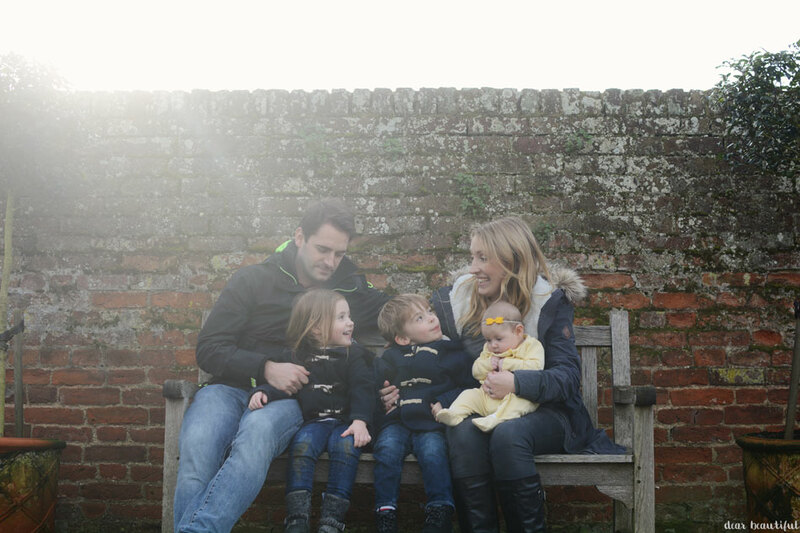 And it can be any family photos at any time in the month, not just the ones you link up for The Me and Mine Project blog post. 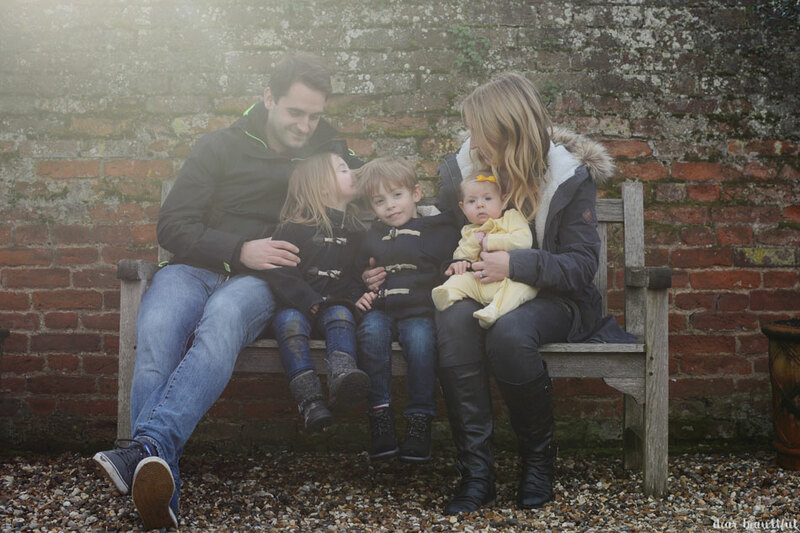 I'm hoping we can create a real community and a massive collection of lovely family moments and memories. This year I am again being joined by my cohosts Alex, Fritha, Jenny, Katie and Lucy. So do pop by all their blogs and see the photos of their families that they are sharing this month. And link up your family photos at the bottom too, I can't wait to see them all. Your littlest little love is a total scene stealer- such a little cutie and with such wonderful expressions!! It sounds like January has been busy but good, I just can't believe it's gone so fast! Wow look how much little lady has grown!! She's looking so much stronger and not so much a newborn now. These are gorgeous pictures, that are making me feel very excited for the months ahead of us. My brother has been raving about Mr Robot, so it's on our list of things to watch too. Beautiful photos, I love that you are all looking at each other and its so natural, I am sure if I tried that it wouldn't be as natural looking. She looks like shes full of energy and happiness, she is definitley enjoying herself! Oh Lucy these are just beautiful to kick off 2016 Me & Mine. I love this project and you are right some months are sooooo easy to capture the family together in their element and some are soooo hard this month I will admit everything from mommyville, to blogging to wifeville has been tough. I am like you though I never want to not document our lives good or bad though and I think MM and Daddy have the same thing going on this month. I mentioned it in my post too she constantly has to been within reach of him having inside jokes. It's bittersweet. Look a little princess taking it all in like a pro me and miner already. Lovely captures thats for hosting this project that always motivates me to capture my family each month when I know if I stopped doing this we wouldn't have any. For that I thank you ever so much for it. What a wonderful start to the year! I love seeing how you have gone from 4 to 5 so effortlessly. Such a lovely little family. Hope to see you all in the spring. How beautiful are these photos, they really are so relaxed. Thank you for carrying on this project, it is a really special project. Do you use a remote or a timer to capture your photos? I love these photos Lucy - you all just look so happy together. I think I said it last month but I as start my third year of Me & Mine I just wanted to say thank you for starting this project. I love having all our family pictures to look back on and I'm sure we wouldn't have them all without Me & Mine. Gorgeous photos. I love the yellow sleepsuit on little lady. I am obsessed with cute sleepsuits from Next. My little one is on a lot of different ones too. 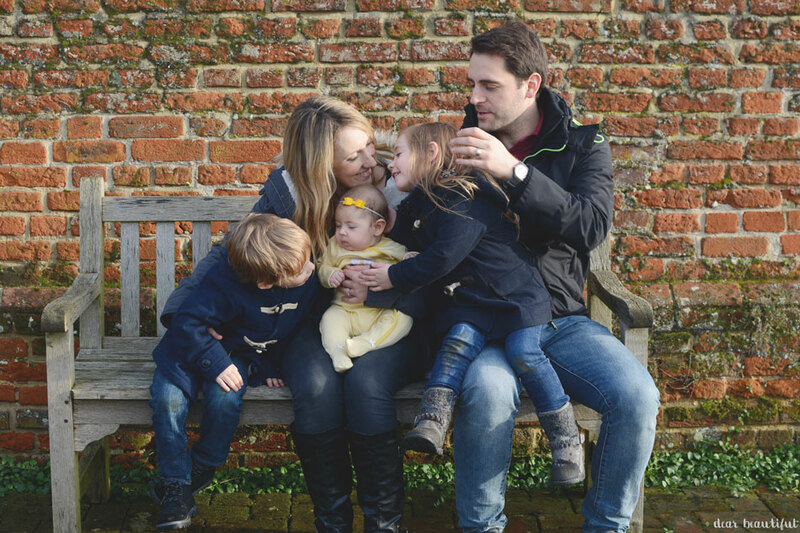 Gorgeous family photos; you suit being a family of 5 so much! Such a lovely post as always - gorgeous photos and you all look so happy!